There is mounting evidence that Archos seems to put their great emphasis on the booming field of virtual reality, by launching its own virtual reality device - Archos VR Glasses. The headset is similar to the GearVR in that it requires a smartphone with a screen size of up to 6 inches to provide the display, but isn't confined to Android devices and also works compatibly with Windows, iPhone handsets or any of which can slot into the front of the headset. So if you happen to have some funny DVD collections at hand, ever thought of enjoying them with Archos VR Glasses while lying in the soft couch in comfort? The below article illustrates the best workflow of viewing DVD movies on Archos VR Glasses, just move on! Actually, as all we know, Archos VR doesn't include a drive for playing DVDs. That's to say, for the purpose of enjoying DVD films via Archos VR Glasses easily and freely, you'd better rip the contents off the DVD disc first and then convert them to Archos VR preferred video formats for playing further. That may sounds a bit complicated, but it isn't. To resolve all the above puzzles, what you need is a third-party program like Brorsoft DVD Ripper. With it, you can effortlessly rip DVD to Archos VR Headset supported video format with fast speed and excellent output quality. In addition, this DVD Ripping tool can also keep your desired subtitles while converting DVD to various popular video formats like AVI, MP4, WMV, MPEG, MOV, FLV, MKV, 3GP, etc. as. What's more, it can also rip DVD to optimized video for playback on iPad Air, iPad Mini, iPhone 6/6 Plus, Samsung Galaxy Tab, Galaxy S6/S6 Edge/S5/S4/S3/S2, Zune, Archos, iRiver, Blackberry, Xbox 360 and more. If you are a Mac user, you can turn to Brorsoft best DVD ripper Mac (El Capitan included), which has the same function as the Windows version. Launch the the Mac DVD to Archos VR Converter and click "Load DVD" button to import DVD into the program. ISO and IFO files are also supported. Click Format bar and select MP4 as the output format from Common Video list. 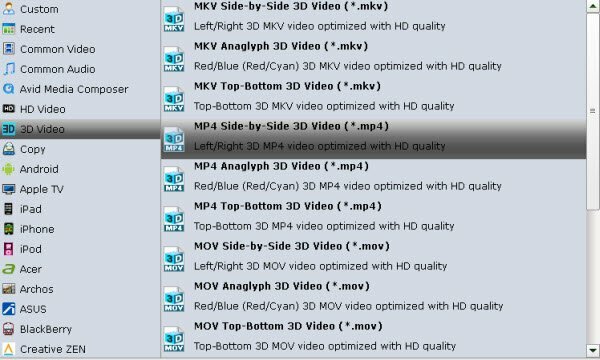 If you want to get 3D effect, please click "Format" and select "MP4 Side-by-Side 3D Video (*.mp4)" from "3D Video" category as the output format. Tip: Click Settings to adjust the parameters like video codec, video bitrate, video frame rate, audio sample rate, audio channel. 1920x1080 compressed side-by-side 3D should be resampled to 1920x540 resolution full side-by-side resolution. And keep audio in AAC or MP3. When you have finished all the above settings, you can simply click the Convert button on the main interface and let the software do the DVD to Archos VR Glasses conversion for you. After the conversion is over, connect the USB drive with computer and head to the destination folder where the converted files are stored and get them to Archos VR headset for enjoyment using its Archos Video Player app without any hassles. Now, just enjoy.